So we’re a few weeks into our Mines of Phandelvar adventure and I wanted to make a small sidetrek, partly because I want to leave a few weeks gap between adventures and write ups so that my players don’t get the adventure spoiled and partly because something has been bugging me right from the start, the Forgotten Realms. 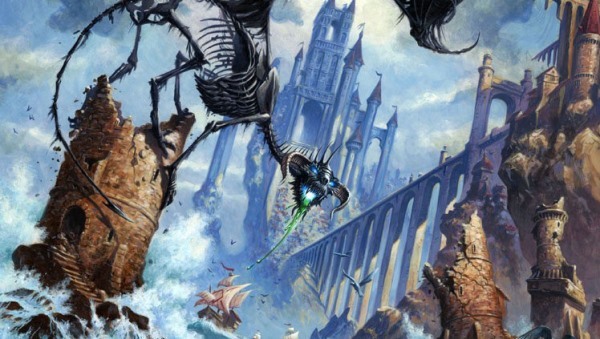 Don’t get me wrong, I’ve got nothing against the Forgotten Realms as a setting, it has become the de facto standard for Dungeons and Dragons for many years, even way back in mid-nineties when my previous D&D sessions where in full swing, the Forgotten Realms where still the primary setting that TSR focused on. While it was true that TSR supported a veritable menagerie of settings, the Realms always received top billing. The Realms are where your basic Dungeons and Dragons is set; high fantasy, plenty of different races, monsters and magic and in its tone it is not far off the other setting I used to play way back then, Mystara. So my problem is not the setting or the tone, my problems is that because TSR and then Wizards of the Coast have been making supplements for the setting for over 30 years there’s just too much to get my head around. 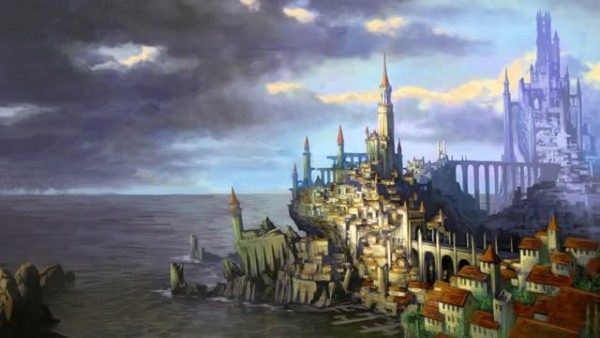 My problem is mostly my own, the adventure in the Dungeons and Dragons Starter Set is located around the city of Neverwinter on the Sword Coast, it’s probably the most recognisable region in any D&D property, what with numerous books, board games and video games being set there. 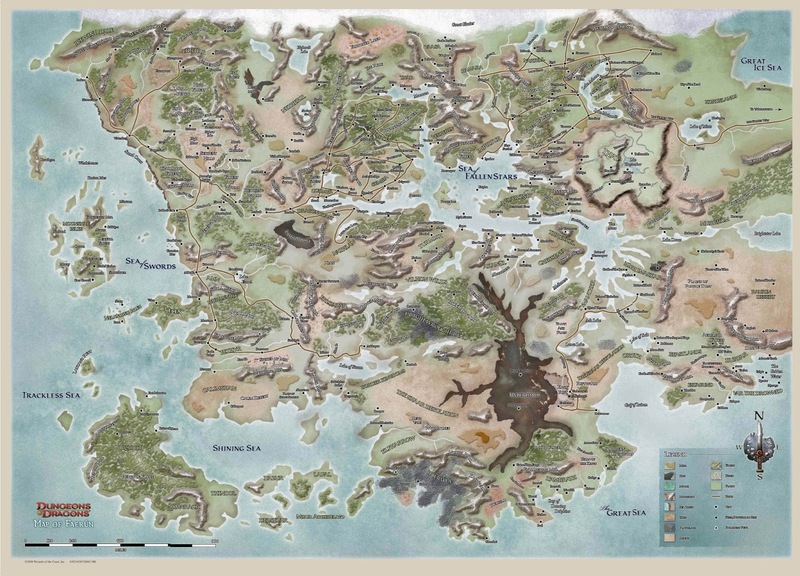 I wanted to help flesh out Neverwinter Wood, Neverwinter city and the surrounding countryside. I wanted my players to feel part of a living breathing world that has existed for thousands of years and is still going on around them. This is when I started my research, and I’m beginning to think I shouldn’t have. The first problem is where do you start? The Forgotten Realms wiki has a lot of information but is mostly a collection of snippets of information that doesn’t really tie together in a cohesive form. I’m still looking for a really good timeline of the Realms. There are libraries worth of older Forgotten Realms source books that are huge tomes of information but try to cram an entire world into a few hundred pages. There are the novels by writers like R A Salvatore that I could read and give me characters and flavour. There are even a few videogames set in and around the sword coast. I was presented with a massive buffet, resplendent with all manner of treats, and just like visiting a real buffet I wanted to try everything. The problem is I did, and it’s left me with a Forgotten Realms belly ache and meat sweats. The problem is there is just too much, just looking at the North Coast region alone, every person that sets foot out of their tiny house in Waterdeep or Neverwinter will trip over three apocalyptic plots before lunchtime. Restricting myself to just the information released for Dungeons and Dragons 5th edition, you’re still faced with dragon gods, princes of elemental evil and we’re about to be invaded by a bunch of demons. The worst offender is the 4th edition Neverwinter Campaign Setting. I really should caveat that it is a fantastic book, especially if you link it to the Starter Set, in fact I would say this is the best source book I have ever seen. Even if you ignore every piece of 4th edition rules it is still crammed to the bindings with locations, plots, factions and characters. There really is enough plot seeds to run several campaigns. The problem is, and it’s an odd complaint, there’s too much to fit into even a single campaign. There’s enough information in the Neverwiner Campaign Setting to run several campaigns. So what is a Dungeon Master to do? Well for me it’s a relatively simple solution. My players may be aware of names such as Icewind Dale and Waterdeep, but that’s about the limit of their knowledge. It means I can pick and choose the juiciest parts. Rather than approach the buffet like a gannet and try and eat everything I should approach it like a magpie and just pick the shiny parts that catch my eye. So far it’s worked, and you’ll never know how your players will approach it, when my players visited Connyberry on their way to Old Owl Well, I made a point of describing the earth motes, floating in the air. My players went ‘oooh’ and quickly moved on. So I managed to add a bit of flavour and hopefully my players will remember ‘that village with the floating islands’. But what if your players are also aware of the Realms and all they hold. Well there are several things you can do. You could include all these amazing places, events and people. They could meet Drizzt, Elminster and Kelban Blackstaff, you just have to make sure you balance everything. Or you could move the players to some remote area of Faerûn, they would still be in the Realms and could head back to a major location at any point but you can make something your own. The important part is to do what suits you as a Dungeon Master and the kind of games your players want to play, as we always say in engineering “if in doubt, ask”.